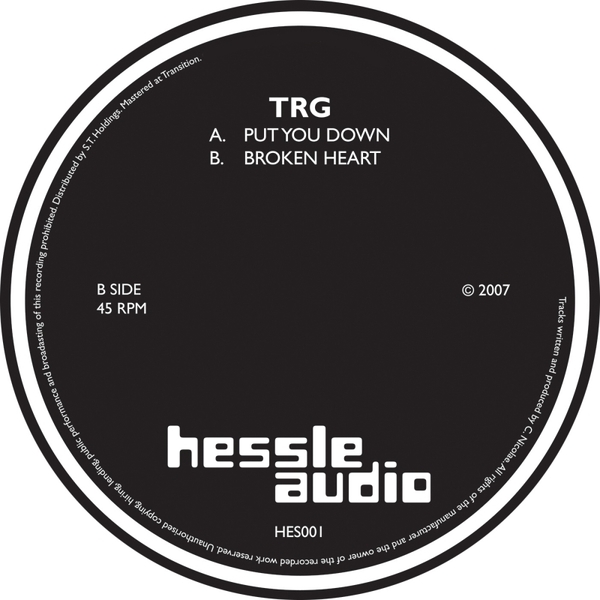 Two extra heavy 2 step rollers outta Bucharest Romania from new producer TRG, for fresh Leeds imprint Hessle Audio. A-side cut 'Put you down' is notable for bucking the dubstep trend/fetish for halfstep patterns with a return to the original dubstep template based around swung 2-step garage rhythms, think vintage El-B or Steve Gurley's Groove Chronicles project, slinky yet propulsive riddims riding turbulent sub lines and a killer vocal motif. 'Broken Heart' on the other side is no less brilliant, keeping it simple with the right combination of keys, r'n'b flavoured vocals and soundsystem ready bass for instant drop 'n play satisfaction. After the success of the Burial album with it's return to 135-140bpm garage rhythms and the current slew of homogenised stodge coming from much of today's halfstep crew this E.P marks a very welcome return to darker swung garage styles for the dubstep scene, I hope there's a lot more where this came from.